The BenQ EW277HDR monitor is clearly designed for home-office or regular office users. It’s key feature is the ability to reduce eye strain, and for users who are spending long hours in front of their screens, this can really come in handy. BenQ has also slapped an ‘HDR’ label on this display, but in all honesty it’s more of a gimmick than a feature you’ll find useful. The EW277HDR is styled beautifully, with sleek lines and a brushed look to the base and rear. Unfortunately it’s all plastic rather than aluminum, but it still holds together nicely and feels quite sturdy. There’s a spot of assembly required, with the monitor shipping with a small desk stand that you can screw into place. You can tilt the monitor slightly for a better view, but you can’t rotate it or adjust the height, which I feel is a missed opportunity. For work purposes I really would have liked the height to be adjustable, as I prefer to have my monitor at eye level rather than looking slightly down at it. The other slightly worrying design element is that there’s no VESA support, so if you’re looking to mount two of these beauties side by side, you’re fresh out of luck. On the plus side of things, the EW277HDR features quite thin bezels, which makes for a much more enjoyable viewing experience when doing everything from editing photos to scrolling through spreadsheets. There’s a small row of buttons on the front which lets you navigate through the various settings, but unfortunately these buttons aren’t labeled, so it’s just a question of pressing a button and then looking at the screen to figure out which button you need to press next. To the right is a dedicated button which lets you switch the HDR and Brightness Intelligence Plus (B.I+) on or off, which we’ll cover in the next section. At the back you’ve got two HDMI 2.0 ports, and a VGA port, along with ports for headphones and Line In – there’s no DisplayPort option as the resolution is only Full HD. There are also two hidden speakers, but the audio on these is barely passable, so it’s best that you use proper speakers or headphones instead. We also wish that BenQ had included a USB port or two as well, as this would have been a very useful feature to have. As previously mentioned, the EW277HDR is designed to reduce eye strain. It does this through a number of features, the first of which is Brightness Intelligence Plus, which uses a sensor on the front of the monitor to detect ambient light, and adjust screen brightness and color temperature accordingly. So if you’re in a brightly lit environment, the EW277HDR will display more cooler colors, and in lower lighting it will switch to warmer tones. There’s also a Flicker-free tech that’s applied to all brightness levels, which again helps to reduce eye strain. The EW277HDR features a 27” VA panel with a max resolution of 1920 x 1080, running at 60Hz. For everyday use this monitor would work just fine, but if you fancy a spot of gaming on it, you might be a bit annoyed by the 60Hz refresh rate and 12ms response time. The large screen size is a missed opportunity, since you’re only running at FHD resolution – the ‘HDR’ tag made us assume that this was a 4K display, but alas, it’s not meant to be. The EW277HDR is at its core, a business monitor, without being exclusively branded as such. It’s easily something that would fit right in at an office, or something that would be perfect if you work from home a lot. Buried in the menu settings are a number of additional tweaks to the picture modes that further reduce eye strain. There’s also an odd ‘Smart Focus’ mode, which essentially highlights a portion of your screen and greys out the rest. We’re struggling to think of a scenario where this would be useful, as you have to manually adjust the size and position of this ‘focus’ window. The large screen size combined with the FHD resolution also means that sometimes text can be a little blurry to read without zooming in, which is a problem if you’re reading long pdf files or web pages. The B.I+ did a fairly good job of ensuring that the display was comfortable to look at throughout the day, so kudos to BenQ for this rather smart feature. 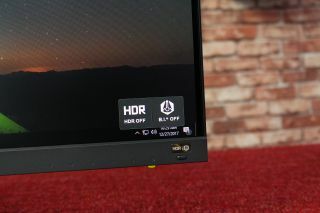 The stumbling block for the EW277HDR is the HDR support – it just doesn’t seem to be worth it at all on this monitor. Obviously the EW277HDR will need to detect a proper HDR source for this to work, but even still the HDR mode is only a small improvement on a standard picture. Even if you have a non-HDR source connected, the monitor can emulate HDR mode, but again this is barely noticeable. Frankly speaking, the HDR mode seems unnecessary, and I would certainly turn off both HDR and B.I+ when editing videos and photos, as they really mismatch what the colors look like. Viewing angles on the EW277HDR were actually very good – it’s a shame that the monitor doesn’t swivel around so you can quickly show a coworker something on your screen. The EW277HDR is packed with a number of very useful features and techniques that are geared towards easing the burden of staring at a computer monitor all day. For the most part, they actually do the trick, and we found our eyes feeling slightly less fatigued after prolonged use. The downfall here is of course the limited resolution, and the fact that HDR is barely noticeable. The EW277HDR is great for reducing eye strain in the long run, but that’s it’s only shining quality.